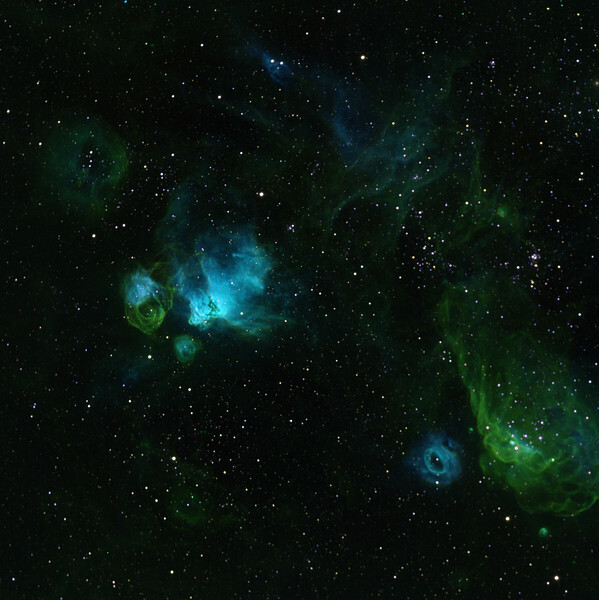 NGC 2035 etc in the Greater Magellanic Cloud. H-alpha green, OIII blue, SII red. 2035 is the brightest blue region just toward 8 o'clock of centre, merging imperceptibly into 2032 and 2029. Just left of that is a spectacular smoke-ring comprising concentric shock-fronts strong in H-alpha. Immdiately above is blue 2040. At the bottom border toward 5 o'clock 2020 is a similar smoke-ring structure strong in OIII. Presumably these two have been blown by strong stellar winds from central stars. At bottom right, sadly sligtly cropped, is a frothy complex strong in H-alpha. There is very little SII in the image. H-alpha 4hrs, OIII 4hrs, SII 3hrs, all in 1hr unbinned subs. Aspen 16M, 20" PlaneWave CDK.